Named after Prof. E.J. 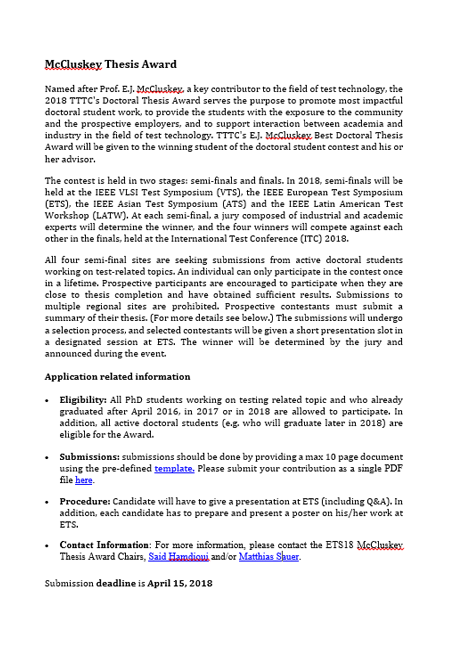 McCluskey, a key contributor to the field of test technology, the 2018 TTTC's Doctoral Thesis Award serves the purpose to promote most impactful doctoral student work, to provide the students with the exposure to the community and the prospective employers, and to support interaction between academia and industry in the field of test technology. TTTC's E.J. McCluskey Best Doctoral Thesis Award will be given to the winning student of the doctoral student contest and his or her advisor. The contest is held in two stages: semi-finals and finals. In 2018, semi-finals will be held at the IEEE VLSI Test Symposium (VTS), the IEEE European Test Symposium (ETS), the IEEE Asian Test Symposium (ATS) and the IEEE Latin American Test Workshop (LATW). At each semi-final, a jury composed of industrial and academic experts will determine the winner, and the four winners will compete against each other in the finals, held at the International Test Conference (ITC) 2018. All four semi-final sites are seeking submissions from active doctoral students working on test-related topics. An individual can only participate in the contest once in a lifetime. Prospective participants are encouraged to participate when they are close to thesis completion and have obtained sufficient results. Submissions to multiple regional sites are prohibited. Prospective contestants must submit a summary of their thesis. (For more details see below.) The submissions will undergo a selection process, and selected contestants will be given a short presentation slot in a designated session at ETS. The winner will be determined by the jury and announced during the event. Eligibility: All PhD students working on testing related topic and who already graduated after April 2016, in 2017 or in 2018 are allowed to participate. In addition, all active doctoral students (e.g. who will graduate later in 2018) are eligible for the Award. Submissions: submissions should be done by providing a max 10 page document using the pre-defined template on the right side. Please submit your contribution as a single PDF file here. Procedure: Candidate will have to give a presentation at ETS (including Q&A). 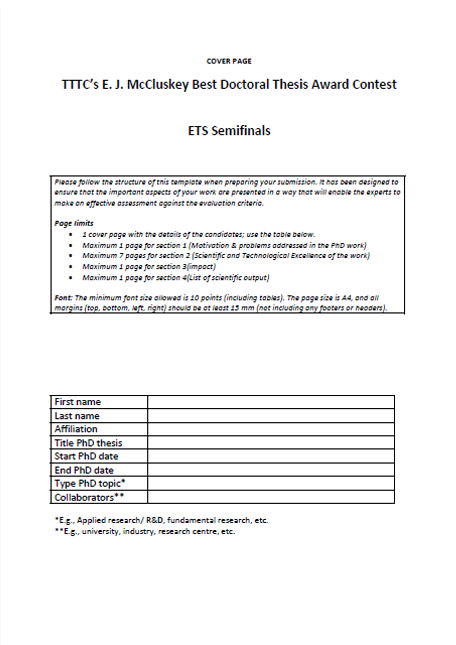 In addition, each candidate has to prepare and present a poster on his/her work at ETS. Contact Information: For more information, please contact the ETS18 McCluskey Thesis Award Chairs, Said Hamdioui and/or Matthias Sauer.